The Staffords and the Richards families were neighbours on the 11th concession of Drummond Township in Lanark County. They may have come from different cultures – one from Ireland and the other from Wales, but they shared much in common. Their families, like many early settlers, had arrived following the War of 1812. At that time Britain was trying their best to populate Upper Canada (Ontario) with settlers from Scotland and Ireland to provide a buffer against invasions. Although this was a very typical story of pioneer settlers in Lanark County, we now have a public snapshot of these families and how they were doing in 1921. With the release of the indexed and searchable 1921 census last Tuesday at Ancestry.ca, it’s easier now than ever to get a glimpse into what life was like at the time. Often a source of frustration to genealogists, there is always a 92-year waiting period before census contents become public. The census itself was released this past summer by Library and Archives Canada, however the ‘searchable’ online version is free and user-friendly, although registration is required. For genealogists and people digging up their own family histories it is the sheer volume and scope of information in this particular census that make it fascinating. Not only can see when people were born, but what language they spoke, and most importantly their heritage – largely Irish and Scottish in Lanark County at that time. You can also find out what they did for a living, and who their neighbours were. The census was conducted every ten years and the decade leading up to 1921 was a notable one for Canada. The country’s population grew to 8.8 million people, which was an increase of 22 %. For all of you avid genealogists and family history buffs, the indexed census will be available free on Ancestry.ca for at least the next three years. After that, the census will remain on the website, but possibly as part of its subscription package. Free access remains available through Library and Archives Canada and at subscribing libraries. 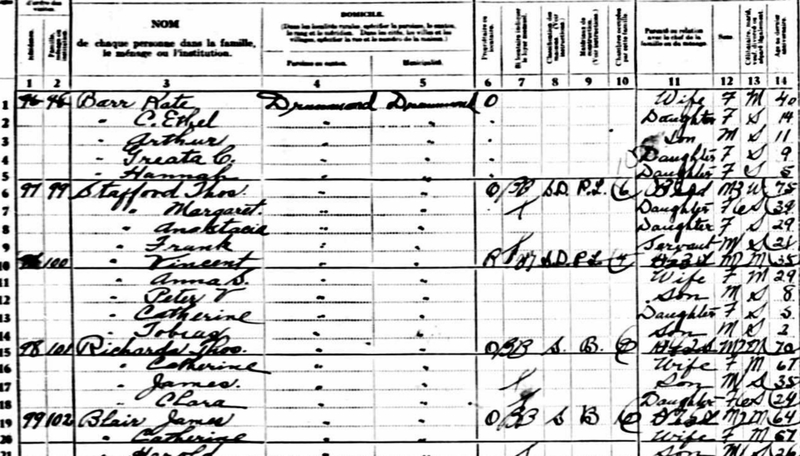 Did you have an ancestor who would have been listed in the 1921 census of Canada? Take a look while it’s free: http://www.ancestry.ca/1921census and find out more about your family history. Registration is required then access is free. Happy hunting! This entry was posted in Genealogy - Tips, Help & Links and tagged Arlene Stafford-Wilson, Books on Lanark County, Ferguson's Falls, lanark county, Lanark County author, Lanark County books, lanark county history, Perth Ontario history. This has been an interesting addition to ancestry.ca, Arlene. I’ve been having a blast finding my husband’s family. I’m adopted and have been unable to find my birth mother’s birthday and family information. It’s been frustrating. I think she is dead but I do not know. I met her. It did not go well. I am proud of being a Relinquished Child. My adoptive family were amazing, and their family tree has been a joy to explore.